On a cold afternoon, SOUND OF SCARBA loads traffic at the newly completed berth at McInroy's Point, while in the background, CalMac's JUPITER heads across to Dunoon. 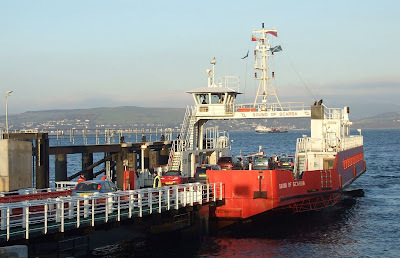 The new linkspan and pier were brought into regular use three weeks ago, and were part of a £4 million investment by Western Ferries. Construction of the new facility commenced in October 2006, and was carried out by George Leslie of Barrhead, while the linkspan itself was built by Ferguson Shipbuilders at Port Glasgow. It was lifted into place by MERSEY MAMMOTH in May.